Sweetie Pie Pumpkin Noodle: Fabulous Friday! wowza, of course I knew you would be fab, any friend of Seleta is a fab friend of mine. Please take a moment and see Sweetie Pie Pumpkin Noodle's happy and chic blog. 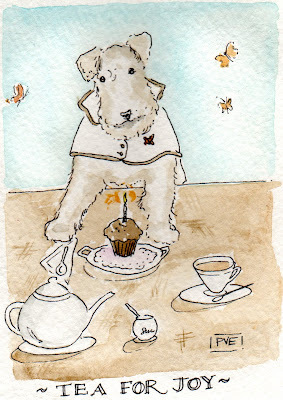 Take a moment on this day, and relish in a royal cup of tea for joy. Use loose tea-blossoms and delight in the aroma of the leaves. Think about the history of tea and how it has inspired many a tea party. Some historic, some royal - yet all bring us a little joy. A perfect beginning to my day begins with Joy. Wish Joyce a Happy Birthday over here. She has been having herself a royal celebration all week long in her own unique style, spreading her wings and lighting us all with special gifts from the heart. Ah, fab friday has arrived. I don't know about you, but friday is not only the end of the week, but the start of something new, a brand new weekend to enjoy. 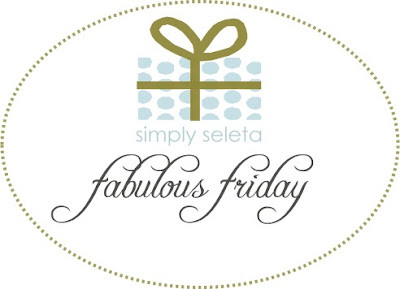 Leave it to the fab Seleta to simply rally the blog troops to attention and and salute something that makes your friday fabulous. Here is a peak at what makes my Friday fabulous and I am in hopes to inspire your friday too. A fab friday involves errands and jobs to finish. A quick stop to my local hardware store and always a smile from "Joe" - Mr. Ardsley Hardware! He always has a smile, a song and something good to share. He is an actor too. I like people who love their work and follow their craft. He knows everyone's name. 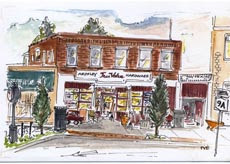 This is an illustration of Ardsley Hardware that I did for Joe as a store mailer. Thanks Joe! Next stop, to the laundry guy to pick up dry cleaning and freshly pressed shirts for my guy. After all it was my guy that told this cleaner that his wife (pve) needed to "pick" the color for the walls. I did and they painted it the very next day and hugged me. How fab is that! I associate blue with water and with clean clothes. The color before was dirty and dingy. 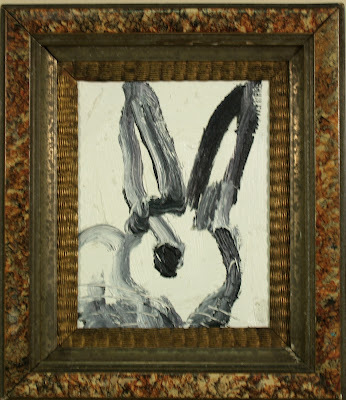 I had told the previous owner, that he should paint it. Good to know that some people listen, right! Thanks Roslyn dry cleaners! I even told them to make a wall like this, and where to order the prints. They also made the curtain for the dressing room, It is a fresh white. The place looks like it was cleaned up by Snow White and the Seven Dwarfs. Next stop, the "Riv" -Riviera Bakehouse. Yep, a bit of Disney right here too in our little village. Mayberry RFD. 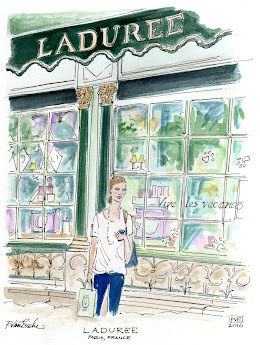 This is the illustration which hangs on the bakery wall. I gave the owner this to remember the 1st location which was quaint and tiny and the line snaked out the door on holidays. They moved to a bigger and more fabulous space foot steps away. Bigger ovens, bigger cakes, more fabulousness. Cakes that are artfully created. The owner's daughter graduated from college, majored in Art and could not land a job, so she began helping out and applying her skills and her passion. Now this bakehouse has books, and has even been on TV! I just need a little something sweet for these brand new fab feet that stepped into our hearts on our avenue, just a few days ago. Lucky me is invited to a little celebration today for this handsome guy. He makes number 3 for a fab family of 5. We are a fab 5 family too as well as the neighbor next door, all 2 boys and 1 girl. The Brit. (thanks for the spelling Heidi!) If you have never been to one, it's a rite of passage and a Jewish tradition. I am amazed at women, up and partying only a week after the baby has arrived. That is just fab in my book. 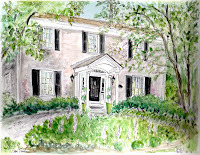 Next stop, to pick up my artwork from my fab framer, Andy - who always has great music playing, a smile and an acid wit. He even greets me "PVE" which makes me feel like a fab celeb. His helper's name is Matt and you know we have a good time matting my work. Lots of colors, textures and even fresh white linen for Seleta. for a fab walk with my fab dog, Bentley. Fab bonus is that I get a walk too! Time to breathe and get outside. Lastly, a moment of fab thanks to fabulous Seleta each of you for all your fab comments and support. You cannot imagine how each of you motivate me. 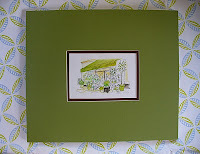 Leave a fab comment and the lucky winner will win a fab pve design illustration. Love to make your day fab. I think I feel a fab nap coming on. Winner announced when my prince awakes me with a fab kiss on monday. Each of us would love a little spot to go to, no permission needed, just a place for quiet, a place to slow down. Today, take yourself to a site and be silent. Stop and allow yourself to listen. Refrain from chatter and witness the humble qualities of your own silence. There are no expectations when there is calm, but there are suddenly answers realized in gratefulness. Gratitude is therefore the heart of inner solitude. During this time of lent, many are fasting or practicing some sort of personal penance in hope for an awakening. Give yourself permission to hope for just that, witness an open and contrite heart. The sacrifice you make requires silence and reflection. Personal permission to be humbled. Domestic sheep instinctively flock together. Sheep are very social creatures as well. You will never see a lone sheep, where there is one, shall be 4 more. This little sheep flocked on over to Calico Corners to meet the fabulous design leader "Eddie Ross." Eddie Ross & Patricia van Essche smiling for the camera (I think I could be old enough to pass for his Mother) Eddie is a young vibrant thing! 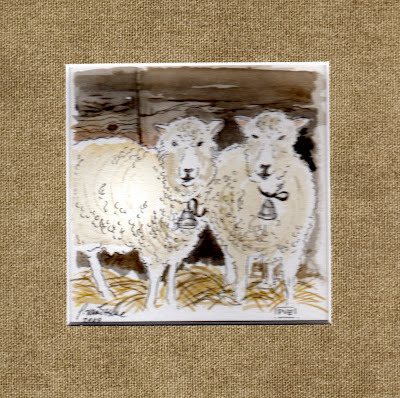 I had planned to mail the sheep illustration, a housewarming gift to Eddie & Jaithan -(which I matted in linen), knowing how much he loves linen and neutrals. Eddie & Jaithan were such warm and welcome hosts as well as the Calico Corners shop staff. It was an intimate setting. Eddie graced us as he presented some wonderful ideas to refresh one's living space. His energy and passion are so fresh and playful. His laugh is infectious and his ability to laugh at himself ranks likability in my book. Really, just a few details and a little creative ingenue are all one needs to infuse and make it distinctively yours. Are these flowers not just gorgeous? So Eddie. As well as the spread of beverages and light fare which was artfully arranged. The grapes were delightful as well as the wine. Thrift store beaded dress from Eddie, "the before"
Eddie showed us a thrift store beaded dress that was transformed into something gorgeous for the home. The envelope please. Transformed into this stunning pillow - "the after"
And the Oscar goes to Eddie and Calico Corners for this award winning pillow. Calico Corners in house event, felt like being at home. Thank you to Calico Corners and to Eddie and Jaithan for a fun and educational evening. Take a look at Calico Corners to add some fresh fabrics to your home, make custom napkins, tablecloths, re-cover a chair, have some new and witty pillows and make your home a place filled with stories. Be sure to flock to an event if Eddie happens to come to your meadow. Seriously, who needs magazines with leading bloggers making live appearances and offering up free tips. Everywhere that Eddie goes, this little lamb shall go. Are you a domestic sheep? 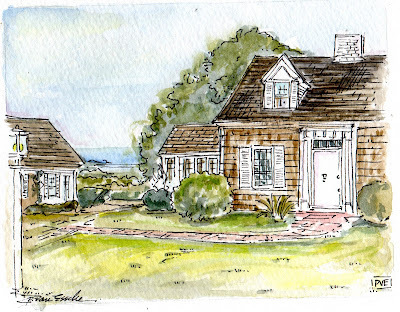 What will you do to add some freshness to your home for Spring? 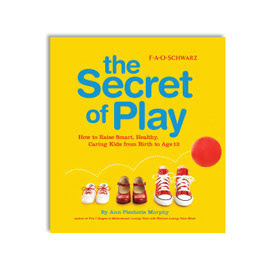 at F-A-O Schwarz in New York City, a book caught my eye, "The Secret of Play" - written by Anne Pleshette Murphy. I was drawn to the attractive cover and that a toy store was touting the secret of play. Engaging in an activity for enjoyment is certainly one that we need to allow time for not only as children, but as adults too. In a world where every ounce of time seems to be scheduled and accounted for, when we stop to play, all the secrets are revealed to inspire imagination and creativity. What is your secret for balancing play in your life or for those that could benefit from a healthy play date? Labels: Book - "The Secret of Play"
Barbie in a box on the shelf at FAO Schwarz in New York City, pve photo. Barbie is celebrating her 5oth birthday. This doll has been a huge part of my life. As a young girl, I loved playing dolls, on hours ad nauseam. This post is a long one, so stay with me. Illustration by Robert Best, hired to infuse a new look to Mattel's -"Barbie." I had a simple collection kept in a signature pink plastic doll case and would find many things to make for them. I would design clothes for them and several of my child hood friends remember what fun we had playing for hours with our Barbie-dolls. I recently ran into an old childhood friend and we reminisced about those days and the countless hours we spent playing with dolls. If only this special doll of grace existed back then. 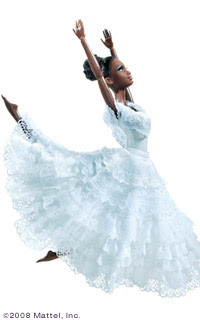 She is "Judith" dancing "Revelations" from the Alvin Ailey Dance Company. I danced for 13 years and had the pleasure of meeting Mr.Ailey as he was a guest at the University of Louisville where I took an intensive summer dance camp. He taught a class and was mesmerizing. I will never forget his voice nor his words that it had to come from the core, for the leg extension. If you have ever danced, you know that is the truth. He lifted "my leg" which I shall never forget. Today, girls can play and design the outfits on-line. Just think of all the possibilities. My daughter and her friend loved playing at FAO Schwarz in New York on a recent shopping play day. The Barbie area seemed to be a popular spot for mothers and daughters of all races which shows just how far we have come. I have always loved all the accessories, the bags, the shoes, the gloves. Especially the fur trimmed ensembles. There was something so elegant about them, especially all the fur trappings. From NY Fashion week, a nod to Barbie and her elegant look and tiny waist. I fathom trying to belt a fur around this waist. How about you? Getting them ready to go out required work, the gloves were not easy to slip into nor the glass slippers. I fondly remember having a clear slippers and thinking every girl needed a pair. Sling-back heels were also on the list of must haves for a trip to the beauty parlor. Note I did not use the word "salon." One of my favorite things about Barbie was her hair. I loved styling chic chignons or the quintessential ponytail like that of a horses tail. I used them to model a style and then mirror that style. My big sister sent me the above photo just yesterday. 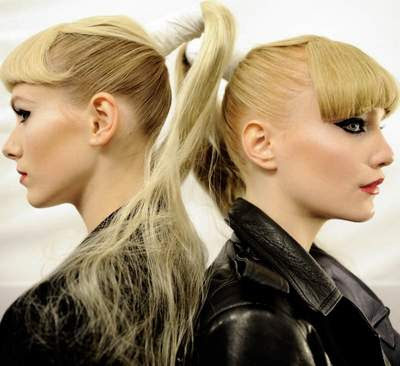 Now that my hair is short, I long for a pony-tail like these gorgeous dolls. I even had the doll which you could lengthen or shorten the hair length. I also cut the hair in short sassy styles like "Twiggy" to give them a modern edge. I hated that the feet of the dolls was already posed for high heels. It ruined it for a day of ballet flats or those mod white patent leather go-go boots. Then "Skipper" came on board and she saved the day with flat feet and a flat chest, all ready for a crafty and active life. 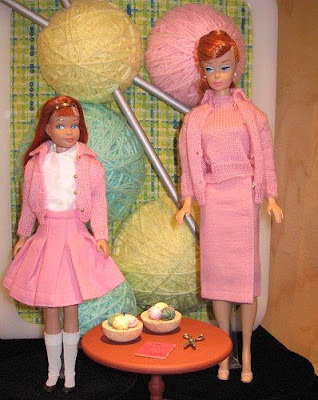 Skipper and Barbie are all ready for their weekly knitting group. 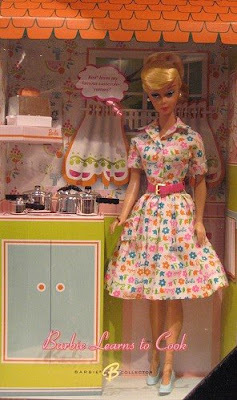 Barbie even learned to cook. My Mother had a pink and avocado green kitchen. But after a hard day of work over a hot stove in the kitchen sporting a shirtwaist and heels, how about slipping into something for the Oscars or perhaps serving your guests Oscar Mayer products, like pigs in a blanket or bologna and saltines. There are always "takers for classics." Love to know what dolls or toys filled your child-hood with joy. Welcome to my Sunday shelf. I have a shelf in my home which holds books, framed photos and a variety of objects. This is a small landscape that I painted in acrylic several years ago on louan mahagony panel. It has been on my shelf and never framed. I look forward to visiting this island again, and painting a small collection for my shelf. Carrying these thin panels and just a paint box of acrylics is easy and carefree. Try it on your next trip. What is on your Sunday shelf? This "smiley face" followed us all the way home. Hope you take notice of what is smiling upon you today? Have a weekend full of smiles. Smile for the camera. Yesterday was a day full of "play"- in New York City and I was positively crazy for the "silly wabbits" in the windows at the posh Fifth Avenue store, Bergdorf Goodman. The Artwork of Hunt Slonem was on display along with a witty collection of "scwewy" fashions for which I have a wild hair for, just look at that dazzling necklace above along with the cleverly arranged palette, brushes and tubes of paint. You do remember "Elmer Fudd" - and his penchant for "silly wabbits" likes Bugs Bunny. This rabbit has his brush fully loaded, along with this colorful "Balenciaga" bag. I also spotted these bags at Barneys on display. They are witty, full of whimsy and have a casual sophisticated yet -fun flair. I think we all could use a little color, as we hope for Spring. obsessed with restoring order. I'd like to think of it as magical and lucky, akin to pulling a rabbit out of a hat or that of a "fatal attraction." I know, I just could not resist wanting to know more about this artist, Hunt Slonem and of course the to die for fashions. The above porcelain dish was produced by Haviland & Co. - the china company which was founded by an American who visited Limoge, France in the 1800's to oversee the production of china. This casserole dish was a gift from my mother along with ten exquisite serving dishes. I adore the deep blue and gold, the scallop pattern and the delicate branches painted upon the lid. When entertaining, nothing is easier than serving one casserole, a mixed green salad, some fresh warm rolls and a cheese platter. 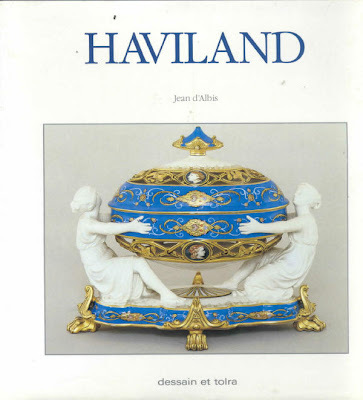 Mr.Haviland stayed in France and founded Haviland-Limoges, a re-knowned porcelain manufacturer. The above plate was produced for President Lincoln. Many are wondering what pattern will the Obama's select for the presidential china. Has the eagle landed? An exquisite Haviland piece. Go to the site here. 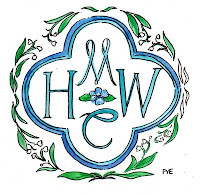 Many heirlooms in my Mother's home were from Great Aunt Louise. She had amassed quite the collection of antiques along with 3 husbands but never any children. Here she is (below) standing next to my Uncle Bob and she is wearing her signature scalloped front open cardigan which she sewed. She loved "Stewarts Dry Goods" a shop where she would go for her fabrics. She had a passion for textiles, notions, antiques, fruit cakes and sherry. I have the fondest memories of spending time with her, the sweet smell of english lavender soap and her porcelain skin. Words seemed to slip off her tongue with a lady-like high pitch, finished with a "You know what I mean" - I truly think that was her way of getting the last word in and her way of wanting to be certain that she was understood. She came for special dinners, like birthdays and would always bring our favorite "Ermin's Ice Cream." The ice cream had a distinct flavor with small bits of butter that would linger. It was rich and fine. 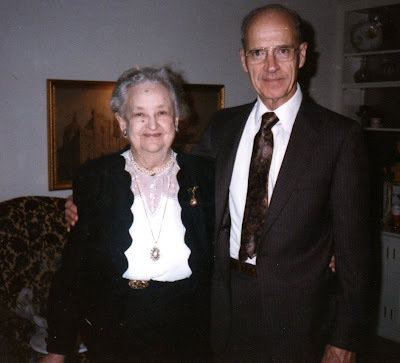 "Great Aunt-Weezie" with "Uncle Bob" - "Porcelain People"
Today, I ponder the fineries. Do you have "porcelain people" in your life that represent a time and place which made an influence over you? So much history, all in a dish.